According to regulation of the government, Vietnam visa exemption">Vietnam visa exemption is still applied to citizens of 10 countries in Asia and 7 other countries outside of Asia. Citizens of 7 countries are unilaterally exempted from Vietnam visa including Russia, Japan, South Korea, Denmark, Norway, Sweden, and Finland. Citizens of above mentioned countries can enter Vietnam and be free from visa to Vietnam with the stay not exceeding 15 days since the date of entry, regardless of type of passport, immigration purposes, based on meeting regulations. The exemption policy when entering Vietnam for citizens of these countries will be implemented in a period of 5 years, from January 1st, 2015 to December 31st, 2019 and will be reviewed and renewed under the Vietnamese regulations. Many new contents of the Immigration Law on foreigners in Vietnam 2014 include the duration of Vietnam visa may be granted up to 5 years for investors (previously, 12 months at most); duration of card for Vietnam temporary residence up to 5 years (3 years in the previous regulation). In particular, the provisions were amended tighter as: from the date of January 1st, 2015, Vietnam visa for foreigners does not change purposes, visa has a valid of single entry or multiple entry, depending on the purpose of entry. Notably, the new law will extend temporary residence card for foreign investors and foreign lawyers in Vietnam, and ease the conditions of entry for citizens of certain countries. According to the evaluation, the new law with the simplified procedure will create favorable conditions for Vietnam foreign entry, exit and residence; simultaneously meet the requirements of national security and the maintenance of social order and safety. 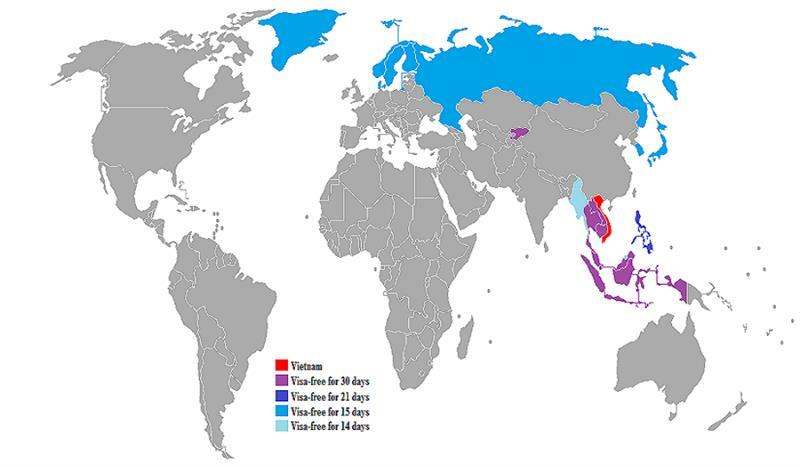 Vietnam is currently applying the exemption visa system within 30 days of stay for tourists coming from ASEAN countries (excluding Brunei in 14 days) and during 15 days for tourists of the following countries: Russia, Japan, South Korea, Denmark, Norway, Sweden, and Finland. Policy on Vietnam visa exemption makes great contribution to the development of Vietnam tourism. The extension of free visa for Vietnam policy not just ensures the successful implementation of strategic tourism development, but also contributes to improving economic- social growth. According to statistics, international tourists to Vietnam have an average expenditure of $ 1,200 to $ 2,500, depending on each customer market and types of tourism. Consumption of international tourists will increase income for private sectors and contribute taxes to state sector, as well as speeding up demands for ancillary products, such as transportation, food, crafts and fine arts..., creating job and social benefits to the community. Vietnam is currently applying system of bilateral visa exemption for a period of 30 days for tourists from ASEAN countries (excluding Brunei within 14 days); and governments of ASEAN members apply visa exemption for Vietnamese citizens when entering the countries. With ventilated visa policy, it will contribute actively to the development of Vietnam tourism in the future when the trend of integration and migration is increasing around the world. Policy on Vietnam visa exemption makes great contribution to the development of Vietnam tourism.